As you must be knowing I recently made a trip to Al Fateh Store Centaurus Mall Islamabad.So who could return from there after not buying a single thing!Its got tons of brands & make up products.To see my post on Al Fateh store click here! Among my some shopped items was this Kajal I was waiting for a long time now! 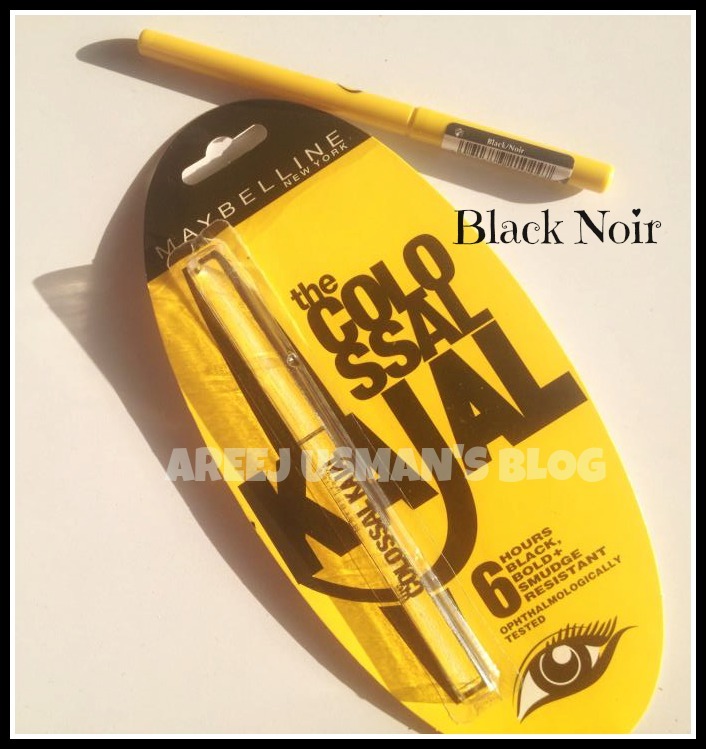 Yes its none other than the Maybeline Colossal Kajal in Black Noir! This product has been the talk of the day lately & much hyped about.In this review we ll know why it is so! Eyeliners & Kajals are my favorite products when it comes to the make up products I buy most.It is not that I dont like buying lipsticks,lipglosses.blushers,mascaras etc but I definitely will choose an eyepencil over a lipliner or lipgloss.I dont know if that has to do with me being an eye make up lover. Ok so I already own the Colossal Mascara & this was on my Wishlist as well & luckily its available now.So as soon as I spotted it I bought it. 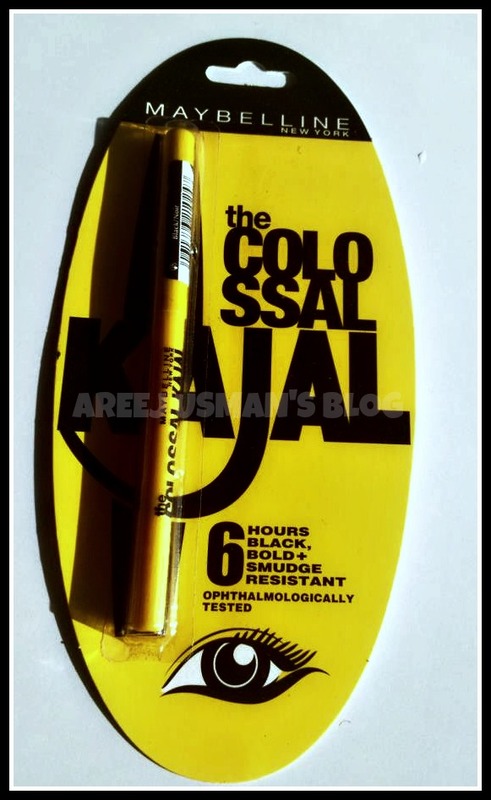 I love the packaging of the Kajal.The bright yellow Colossal trademark color is very eye catching.It is a pen shaped kajal with a tight cap & a twist & turn Kajal in it. 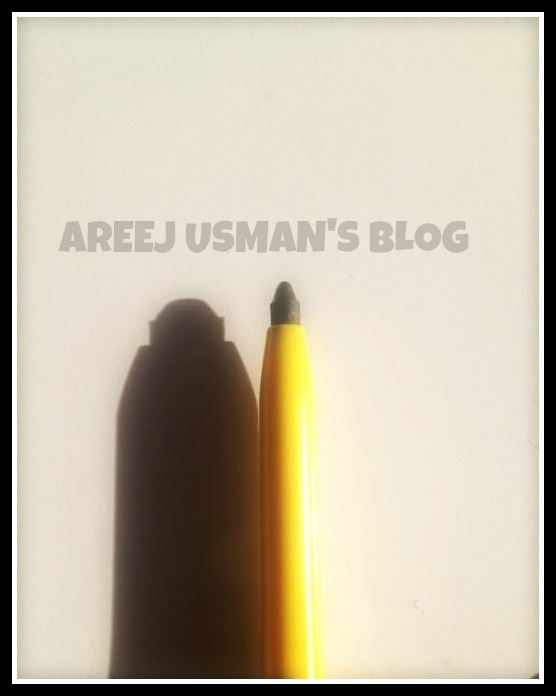 The tip of the kajal is very soft & it glides very easily on the skin.The amount of the kajal is nearly as much as the length of the cap.I think thats a fairly reasonable quantity. Here are the swatches for you! The left one is a singly swarched while the right one is a double swatch.It obviously builds up with more product. 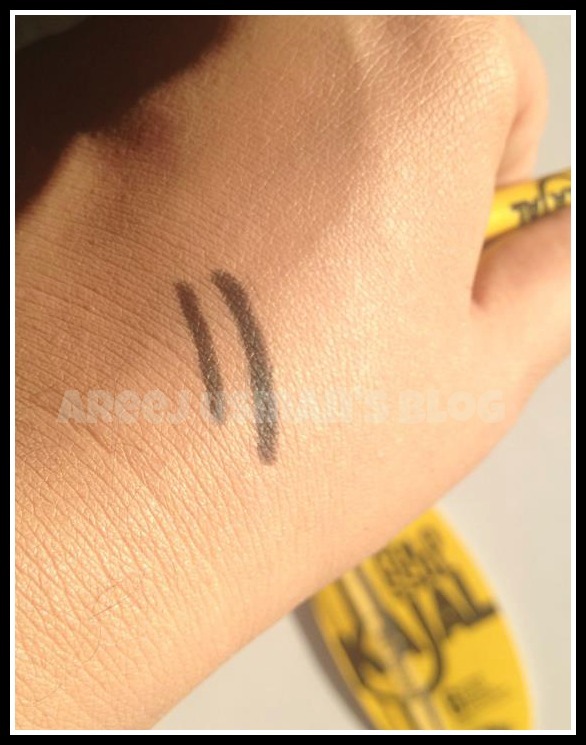 I love to underline my waterline with kohl and kajal liners.Therefore I am always looking for stuff that is great for the waterline.So lets see what effect Colossal Kajal has on the waterline. 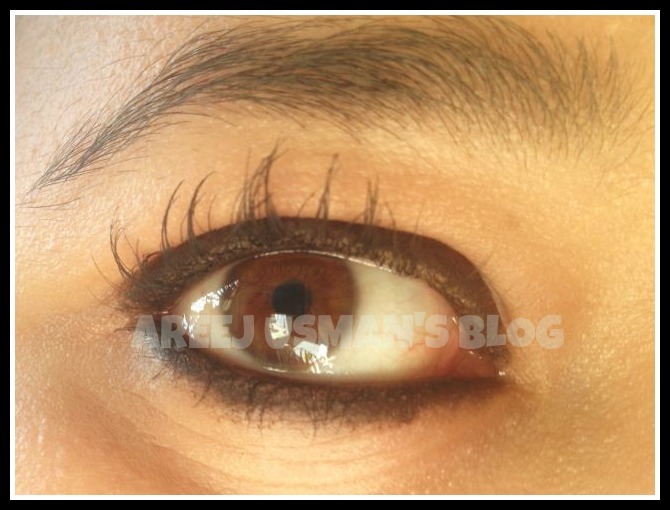 Ok so now to talk in detail about the kajal.I agree to the fact that the application is very easy & the soft tip of the kajal glides on easliy on the waterline and the upper lid.I dont use the same pencil or kajal to draw the upper lid usually but here I used the same kajal to try.Normally these days I use a gel eye liner or Color Studio Knock Out Marker review here. 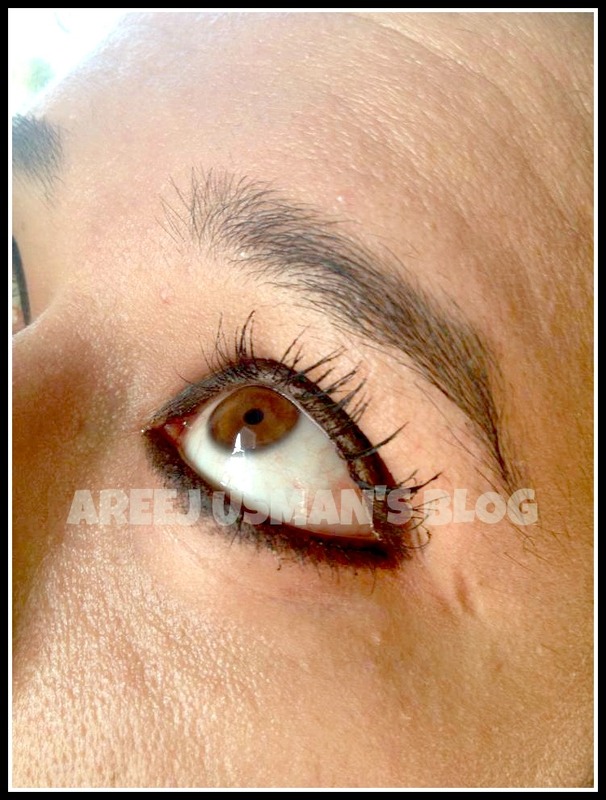 The only negative that I found about this kajal was that a person with oily skin or eyelids should not apply this to the upper eyelid as it leaves a thin line on the crease area after some time. 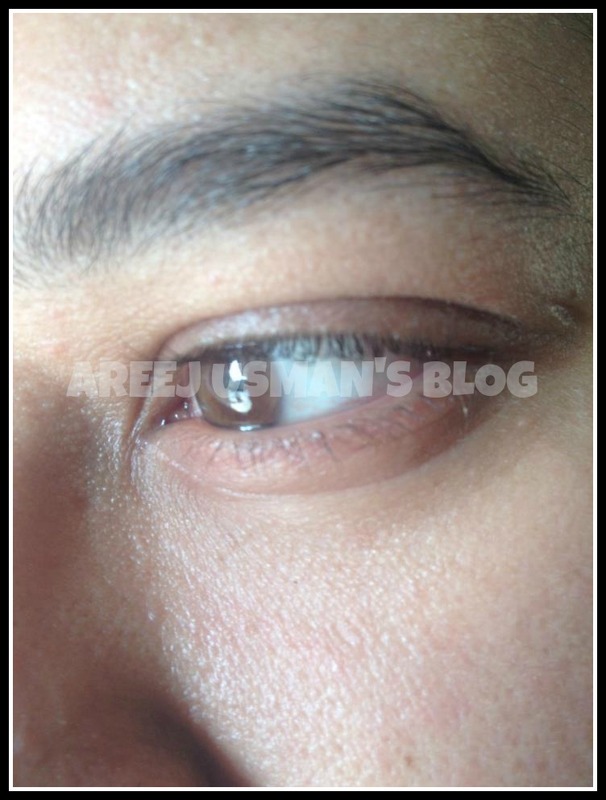 I dont know whether a primer would help but overall in summers I ll not use this on my eyelids but only to darken the under eyes n waterline.I love the effect this black color has given to my eyes.The black is enhancing the natural color of my eyes.The staying power of the kajal is really good.I was so tired after my day that I went to sleep with it but the next morning it was there though somewhat smudgy!After all it was a NIGHT! Have u already bought urs!How was your experience? Looks good.. Does it smudge around the eye corners or bleed?? It would transfer to oily eye lids but doesnt appear to smudge from afternoon to evening.Though after a night of wearing it was smudgy. 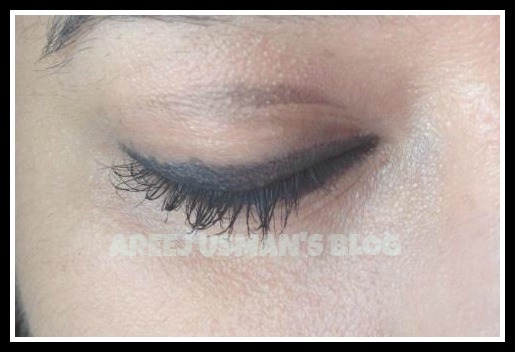 I read a few reviews about this and almost every one had issues with the staying power of this kajal.It looks really nice on your eyes though:) thanx for sharing. The 4th image with liner is stunning . I was thinking to buy this kajal but after reading your review i am thinking to skip it. 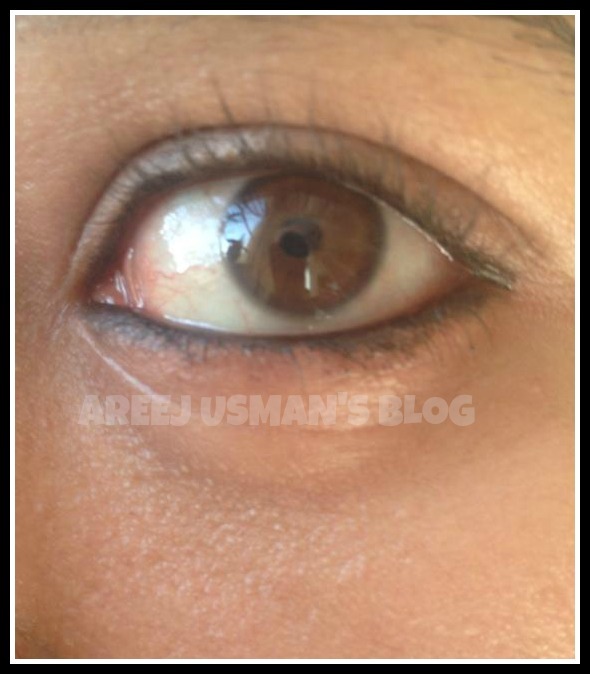 I was waiting eagerly for your review about this kajal,I got it too and as after reading your review I am surely going to skip the application on my eye lids.your reviews always give the true picture of the products.and it really suits you, love your 4th image.keep it on. i love this kajal, but there are so many varients of this, the original one has made in london or paris written on the back i think, i bought this kajal from al fateh again, and it was made in pakistan, is that original too?